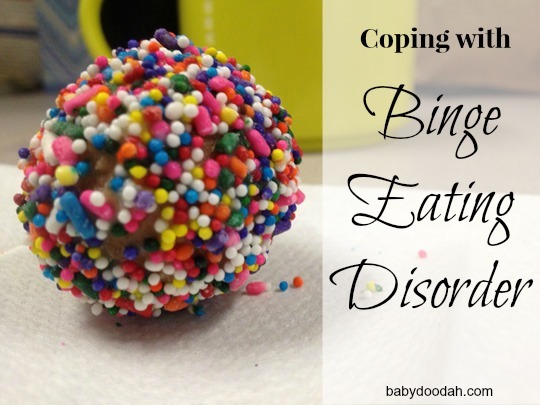 What I Ate Wednesday - Binge Eating Disorder - Baby Doodah! Binge Eating Disorder is an eating disorder characterized by binge eating without subsequent purging episodes. Hi all, it’s been a few weeks since I’ve participated in What I Ate Wednesday, but finally getting back to it. This week’s post is a bit different than previous week’s because I want to come clean in an effort to get my eating in check. I want to be successful with my resolutions this year, in order to do that I need to grow as a person. One area where I truly suffer is my eating, I have binge eating disorder (or BED). Many of you may have never heard of BED, neither had I until I discovered Kristin Gerstley’s blog End Binge Eating Now. I’ve always known that I have an unhealthy relationship with food, that I prefer to eat alone because then I can eat an unheard of amount of food without anyone knowing (or judging), but I was unaware that it had a name. I randomly came across the term Binge Eating Disorder while on Instagram. An individual that I follow has overcome the disease, she was sharing a photo and a story from her journey, and it hit me, her story was describing what I deal with on a near daily basis. As I googled it, and read through Kristin’s blog reality slapped me hard in the face. Now, the question is how do I overcome Binge Eating Disorder? This isn’t something new, I’ve dealt with this for a large majority of my adult life, but I’ve reached my breaking point. The thing is that I don’t just want to cope with BED, but actually overcome it. BED is like many other addictions, the only difference is that I can’t cut food completely out of my life, I can’t just stop eating. Instead I need to wrangle it in, and I have no idea how to do that, this is where the research begins. I’m tired of dealing with this on my own, there are many online support groups, classes and blogs that have helped thousands overcome BED, allowing them to live a happy and full life. I want to be one of those people, and my journey starts here, today. I’m sharing this with you, readers, because I would love if you’d be willing to help hold me accountable. Thanks to Jenn for hosting! Please be sure that you stop over and visit all of the wonderful What I Ate Wednesdays. What’dyah say? Are you willing to be my cheerleaders, and help me on this journey? Do you suffer from binges? If so, how did you overcome them? Have you ever read Brain Over Binge? If you google it, you can find blog posts by the author. This book, and of course with God, this book changed my life. I would be happy to share what I’ve learned if you ever need to chat just email me. It is such a frustrating struggle that seems impossible to stop. But, you can do it! It’s not about will power… You already have that! Hi Karla! I haven’t read Brain Over Binge, and that’s one I’ve never heard of. I’m going to have to look into it. It sounds like a great read! I want to be able to say “my life was changed by…” I just need to find the thing that will help me get there. Thanks so much for visiting! Oh Jillian! I am so proud of you for posting this! I too have an unhealthy relationship with food so I think I understand what you are dealing with. I will happily be your cheerleader through this!! I am here for whatever you need, pretty lady! Hi Aimee! I appreciate you stopping by, and being willing to be my cheerleader. It means a lot! I think you’re very brave, and I wish you great success. Thank you Ellen! And thanks for visiting. just stumbled on your blog. i’ve been dealing with BED for the last year and i find you very brave to have posted this. it is nice to know others out there understand how out of control and exhausting it is. i’m wishing you the best. day by day. Hi Sara! Thank you for stopping by. It was really tough to decide to come clean on my blog, a public place that anyone can read. But what convinced me to do it was the fact that I could be helping another person who is dealing with something similar. I completely understand what you are going through and am happy to help, if you ever need to chat. Take care of yourself!